There seems to be an invisible line that separates a residential contractor from venturing into commercial products. The style and size of compressors can be this line. Many residential contractors tend to stay away from compressors larger than 5 -7.5 tons, simply because they are unsure or possibly intimidated by older semi-hermetic compressors. In doing this, they are greatly limiting their earning potential. Semi-hermetic compressors have been around since the 1940’s, and in many ways, are easier to service and diagnose than welded hermetic (pot) compressors. One of the advantages to working on a semi-hermetic compressor is the sight glass that allows you to easily check the oil. This means that you can see the oil level and it’s condition without taking a single tool out of your bag. When the oil is ready to be changed, it can be done through convenient oil service ports. Small welded hermetic compressors don’t have this option. A semi-hermetic makes field repairs (on most moving components) possible as well. If a tiny suction valve fails on a pot compressor, the whole compressor is replaced. If this were a semi-hermetic compressor, it could be repaired and back on line the same day. 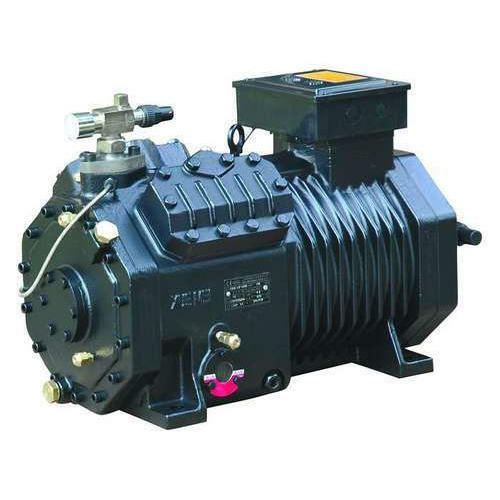 This is similar to an electric motor; if it goes bad on a large open drive compressor, the motor can be changed without removing the refrigerant charge from the compressor. The physical size or amount of cylinders on a semi-hermetic compressor can be intimidating. A large open drive compressor with 12 cylinders may look like a small submarine, but its basic function is the same as a small welded hermetic compressor. Remember, even though you can’t tell from the outside, you may be working on a small welded hermetic compressor that has as many as 4 cylinders. If you happen to have an old semi-hermetic compressor at your shop, it would be beneficial to tear it down just to learn about its internal mechanical functions. Repeat this several times to get familiar with the parts, location, and interaction of the different components. Having a small pocket-sized service and troubleshooting manual is a necessity for learning proper servicing techniques. The best way to learn about compressors, both large and small, is from manufactures, distributors, trade schools, and organizations that offer training for compressors. Furthering your education and training is a direct way to increase your company’s earning potential. Tony Albers is a highly successful trainer who has taught heating and air conditioning classes designed specifically to meet the needs of today’s busy technicians and engineers. For the past 33 years he has worked to advance the field of heating and air conditioning by teaching classes for IHACI, RSES, Southern California Gas Company, and San Diego Gas & Electric. In the last 23 years he has traveled extensively throughout North America for US Air Conditioning Distributors and Venstar, giving workshops and seminars for large HVAC distributors and manufacturers. Albers has been on the Continuing Education Committee for the Institute of Heating and Air Conditioning Industries and has written articles for Indoor Comfort News, HVAC Insider, and the Southern California Chapter of ASHRAE.